There’s a number of things that are wrong with this response from the APA, but I’m going to focus this blog post on just one area in the response of the APA that indicates that they just don’t quite understand the issue yet. The issue isn’t about “parental alienation syndrome,” nor is it about high-conflict divorce. It’s about Standards 2.01a, 9.01a, 2.03, and 3.04 of the APA ethics code, and whether these Standards have any actual meaning – or are they just empty words without actual real-world impact. Here is the issue: There is no such thing as “parental alienation.” It is a made-up form of pathology. We must return to standard and established constructs and principles of professional psychology. The pathology exists. It is an attachment-related pathology called “pathological mourning” (Bowlby, 1980). Bowlby further links pathological mourning to personality pathology that develops from adverse childhood experiences. The pathology of a child rejecting a parent is fundamentally an attachment-related pathology. Pathological mourning is linked to personality pathology (in this case, the parent’s narcissistic/(borderline) personality pathology). The family systems literature has abundantly and fully described a child’s triangulation into the spousal conflict through the formation of a cross-generational coalition with one parent against the other parent, which can result in an emotional cutoff of the child’s relationship with the targeted parent (Bowen, Haley, Minuchin). We must leave the professional wilderness of “new forms of pathology” and return to the established path of standard and established professional constructs and principles. The issue is the profound ignorance and rampant unchecked professional incompetence of many-many mental health professions regarding standard and established forms of pathology. Premise: Mental health professionals who are assessing, diagnosing, and treating attachment-related pathology need to be professionally knowledgeable and competent in the attachment system, what it is, how it functions, and how it characteristically dysfunctions. Conclusion: Failure to possess professional-level knowledge regarding the attachment system when assessing, diagnosing, and treating attachment-related pathology would represent practice beyond the boundaries of professional competence in violation of professional standards of practice. Premise: Mental health professionals who are assessing, diagnosing, and treating personality disorder related pathology as it is affecting family relationships need to be professionally knowledgeable and competent in personality disorder pathology, what it is, how it develops, how it functions, and how it characteristically affects family relationships following divorce. Conclusion: Failure to possess professional-level knowledge regarding personality disorder pathology when assessing, diagnosing, and treating personality disorder related pathology in the family would represent practice beyond the boundaries of professional competence in violation of professional standards of practice. Premise: Mental health professionals who are assessing, diagnosing, and treating families need to be professionally knowledgeable and competent in the functioning of family systems and the principles of family systems therapy. Conclusion: Failure to possess professional-level knowledge regarding the functioning of family systems and the principles of family systems therapy when assessing, diagnosing, and treating family pathology would represent practice beyond the boundaries of professional competence in violation of professional standards of practice. Premise: Mental health professionals who are assessing, diagnosing, and treating the trans-generational transmission of complex trauma within family relationships need to be professionally knowledgeable and competent in the nature of complex trauma, as expressed both individually and through family relationships. Conclusion: Failure to possess professional-level knowledge regarding the trans-generational transmission and expression of complex trauma when assessing, diagnosing, and treating family pathology involving complex trauma would represent practice beyond the boundaries of professional competence in violation of professional standards of practice. Many-many-many court-involved psychologists are absent professional-level expertise in the attachment system, and yet they are nevertheless attempting to assess, diagnose, and treat attachment-related pathology despite their professional ignorance and incompetence regarding the characteristic functioning and dysfunctioning of the attachment system. Many-many-many court-involved psychologists are absent professional-level expertise in personality disorder pathology, and yet despite their professional ignorance and incompetence these mental health professionals are nevertheless attempting to assess, diagnose, and treat family pathology that is being created by a parent’s personality disorder pathology, to the great and lasting harm and detriment of these families. Many-many-many court-involved psychologists are absent professional-level expertise in family systems therapy and family systems constructs, and yet despite their professional ignorance and incompetence regarding the nature of family interrelationships these mental health professionals are nevertheless attempting to assess, diagnose, and treat family pathology involving complex family dynamics. Many-many-many court-involved psychologists are absent professional-level expertise in complex trauma pathology as it is transmitted across generations, yet despite their ignorance these mental health professionals are nevertheless attempting to assess, diagnose, and treat family pathology created by the trans-generational transmission of complex attachment-related trauma, despite their professional ignorance and incompetence. As a consequence of the profound professional ignorance and incompetence currently on display surrounding the assessment, diagnosis, and treatment of attachment-related, personality disorder related, family systems related, complex trauma pathology surrounding divorce, many-many-many families are being significantly and irrevocably harmed. These families are asking the APA to provide its psychologist membership with guidance regarding the required professional knowledge necessary to assess, diagnose, and treat attachment-related pathology, personality disorder related pathology, family systems related pathology, and complex trauma related pathology. 1.) Acknowledges that an attachment-related pathology can exist surrounding divorce in which one parent triangulates the child into the spousal conflict surrounding the divorce through the formation of a cross-generational coalition of one parent with the child against the other parent, and that this can result in a cutoff of the child’s attachment bond to the targeted-rejected parent (Bowen, Haley, Minuchin). The pathology exists. 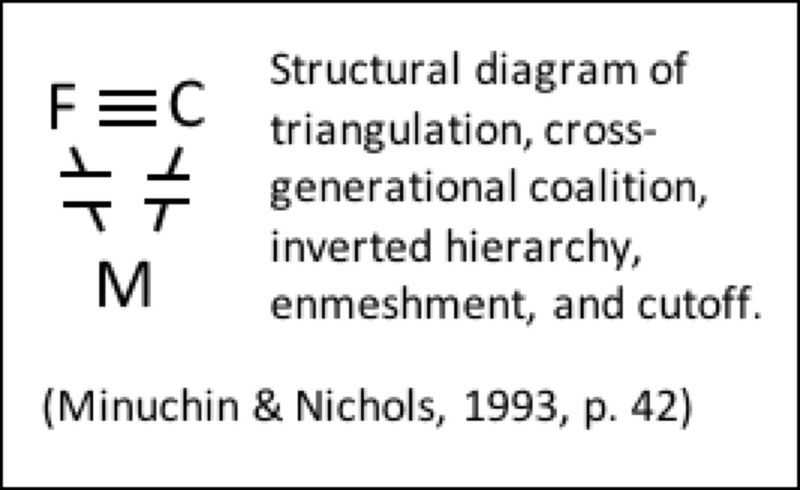 The renowned family systems therapist, Salvador Minuchin provides a structural family diagram for the pathology on page 42 of his book with Michael Nichols, Family Healing. The pathology exists. Call it by whatever name you want, the family pathology exists. Narcissistic and borderline personality pathology exists. We know it exists. The narcissistic personality is vulnerable to rejection and the borderline personality is vulnerable to abandonment. Both rejection and perceived abandonment are part of divorce, and it should be fully anticipated that parental narcissistic and borderline personality pathology will become activated during and following divorce. The activated narcissistic and borderline personality pathology of the parent can triangulate the child into the spousal conflict surrounding the divorce as a means to stabilize the collapsing narcissistic and borderline personality structure that is being challenged by the rejection and abandonment inherent to divorce. It doesn’t take a working group to acknowledge that these forms of pathology exist. 2.) That attachment-related pathology surrounding divorce can be complex and requires a high-degree of professional knowledge and expertise in a variety of areas to competently assess, diagnose, and treat. As a result of the many possible factors potentially influencing family relationships surrounding divorce, the children and families experiencing attachment-related pathology surrounding divorce represent a special population who require specialized professional knowledge and expertise to competently assess, diagnose, and treat. This type of revision to the APA Statement to a more moderate-centrist position would provide guidance that all mental health professionals are required to possess the necessary competence in established forms of pathology when assessing, diagnosing, and treating established forms of pathology, and that the issues of attachment-related pathology surrounding divorce can be complex and require a high-degree of professional knowledge and expertise in a variety of potential component areas of the pathology. If the APA abdicates in its responsibility to ensure adherence to professional standards of practice regarding its code of ethics, then parents whose children and families are being severely and irrevocably damaged because of professional ignorance and the subsequent incompetence created by this professional ignorance, will be left with no other recourse than to file licensing board complaints against the ignorant and incompetent mental health professionals under Standards 2.01a, 9.01a, 2.03, and 3.04 of the APA ethics code. Loving parents cannot be asked to stand by and do nothing while their children are severely and irrevocably harmed. Loving parents will enable themselves of the only recourse they have, if they must. This is NOT the desired course. The desired course is for the APA to provide guidance that establishes that professional knowledge and competence is expected. But in the absence of responsive guidance provided by the APA, loving parents will have no other recourse than to take active steps on their own to ensure the protection of their children through filing licensing board complaints under APA ethics code Standards 2.01a, 9.01a, 2.03, and 3.04. Pathogenic parenting that is creating significant developmental pathology in the child (attachment system suppression), personality disorder pathology in the child (five specific narcissistic personality disorder traits in the child’s symptom display), and delusional-psychiatric pathology in the child (an encapsulated persecutory delusion) represents a DSM-5 diagnosis of V995.51 Child Psychological Abuse, Confirmed. Loving parents cannot be asked to do nothing while their children are being psychologically abused by the pathology of their personality disordered ex-spouse. Parents have the right under Standards 2.01a, 9.01a, 2.03, and 3.04 to expect professionally knowledgeable and competent assessment, diagnosis, and treatment. Loving parent are pleading with the APA to provide guidance to their psychologist membership that will ensure professional competence in the assessment, diagnosis, and treatment of their families. But these parents will no longer stand by and witness the destruction of their children due to the ignorance and incompetence of mental health professionals to appropriately assess, accurately diagnose, and effectively treat the pathology being evidenced in their families. If the response of the APA to the heartfelt pleas of these loving parents is for the APA to form a “working group” to “review the scientific literature,” then the APA must also expect that while the APA’s working group is reviewing the literature these parents will not simply stand by and do nothing to prevent the severe and irrevocable damage to their children caused by the professional ignorance and incompetence of the mental health professionals who are tasked with assessing, diagnosing, and treating the pathology within their family. As long as the APA remains silent, the only other recourse for these loving parents is through seeking enforcement of the APA ethics code one individual psychologist at at time until professional competence is achieved. What other choice do they have? We cannot ask these loving parents to simply stand by and do nothing while their beloved children are being severely and irrevocably damaged by the pathology of their personality disordered ex-spouse and the ignorance and incompetence of the mental health professional to appropriately assess, accurately diagnose, and effectively treat the pathology? To the APA: These loving parents do not want to file licensing board complaints to achieve professional competence. But what other choice are you giving them? They are pleading with you to provide guidance to your psychologist membership regarding expectations for professional competence in standard and established forms of pathology. But these loving parents will not stand by and do nothing, while their beloved child is destroyed. If they must achieve professional competence one psychologist at a time – what other choice do they have? — what other choice are you giving them? It’s not about high-conflict divorce. It’s about professional competence in attachment-related pathology, personality disorder pathology, family systems pathology, and complex trauma pathology. The degree of professional ignorance and incompetence in standard and established forms of pathology is profound. These parents and these families – these children – have a right to expect professional competence. This happens even when there is no divorce , where one parent is lonely for some reason and uses the kid as spouse. It has been going on for centuries in relationships. I think the Mental Health Profession is scared to be The Whistle Blower and expose All the destruction it has caused because it has come to an epidemic and is running rapid all over the world. All the people who have done this cross generational sickness will have to face the fact that they have a PROBLEM going on in their thinking MIND. FEAR FEAR is the Factor for the Alienators and The Mental Heath Field. From Jackie an alienated Mom who has made progress with my one son after decades of alienation . Ryan Thomas has helped me since April 2017 when I came across him on Y-tube videos , now I feel Joy again. Dr, Childress you a Gem… you are waking up a lot of people. God bless you Dr. Childress!!! Thank you for your guidance of leading us out of this darkness, which has been allowed to grow FAR TOO long! I would like build upon on your excellent blog. We ALL have some degree of pathology, including narcissistic and borderline personality traits. The question is to what degree and is it to a level that is causing abusive behaviors or causing high conflict within the marriage. The world’s children NEEDS more healthy intact families! As you correctly pointed out here, the APA needs to focus on ensuring that the mental health professionals accessing, diagnosing, and treating our families are competent and they need to lead us ALL out of the darkness of this pathology and into the light, so families around the world can ALL heal. My family like many families attempted extensive therapy from mental health prior to divorce, which FAILED and divorce was like throwing gasoline on the fire that inflamed the attachment trauma from the previous generation. The leadership of the APA should NOT continue to prevent existing solutions that our family require, but focus on leading mental health on the pathology with these solutions, holding mental health accountable, and arming mental health professionals with tools to address this pathology prior to escalating to divorce, prior to the pathology getting out of control. Mental health told my family that there was nothing they could do (they felt they had no tools and were NOT competent) and that I had to divorce my spouse to get the court ordered help my family required; however, this ONLY made things MUCH WORSE. I believe the trigger is not divorce but rather Narcissistic Personality Disorder. There are many divorced folks that do not put the child in the middle of the divorce nor alienate the child from the “targeted” parent. Oh, does this ring familiar to me. At one point the lawyer for xW offered the “reason” my daughters refused to see me. Ready? It was because I was ‘depressed and moody”. And there you see the perverted schemas that the disordered use to process their reality. Sort of like blaming a shooting victim for bleeding?